marino buwan I am making FF and rlp.pleaz join. 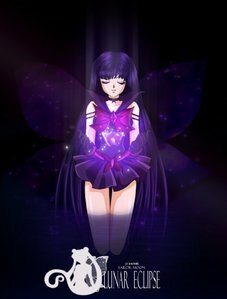 Look: has long dark blue hair, all clothes are black, wings like butterfly(black),she is from dark moon so she has black moon symbol on her neck. Sisters, brothers: Sister light butterfly(she lives in light moon but they are siters because they are both butterflys). Hates: Light moon, Sailor moon. Biggest enemy (-s): Sailor moon, Light moon family. Should be a really good friend with (sailors only): Sailor Pluto, Sailor Saturn. Favorite things to do: Fly, fight, by alone.